According to his brief bio, illustrator Matt Cavotta grew up playing games like Scrabble, Balderdash and Boggle, grew into a fascination with fantasy games like Dungeons and Dragons and Magic: The Gathering, and carried his love of gaming into a career largely focused on illustrations for games. Notably, his work for the Magic: The Gathering card based series and his magazine covers for Dungeon and Dragon show a splendiferous range of grotesque and sometimes gruesome images of fantasy themes. His magical animals, wizards, trolls, dragons, monsters and other bizarre characters are rendered with a strong sense of solidity, texture and atmosphere, which makes them all the more fun. Cavotta uses a strong range of value and high chroma palette to give his images a feeling of intensity and drama. Unfortunately, the images reproduced on Cavotta’s site are inexplicably small. I came across a nice big reproduction of one of his pieces in a Spectrum collection and was impressed with it at the size of a full page. I was subsequently disappointed that the images on his site are not larger. The good news is that there are quite a few images shown, so you can get an idea of the breadth of Cavotta’s work, if not the depth. The bad news is that you’ll need to be patient and perseverant to see many of them because navigation is a bit awkward, requiring you to click and click back to view each image. There’s also no obvious indication that the button labeled “Cavotta Home” at the top of the pages is actually a drop-down menu for the other site sections. There is a menu at the page top for “Other Artists” which leads to a circle of sites of several artists with whom Cavotta apparently shares the masthead of “Daydream Graphics” (including Adam Rex, who I’ve previously profiled). 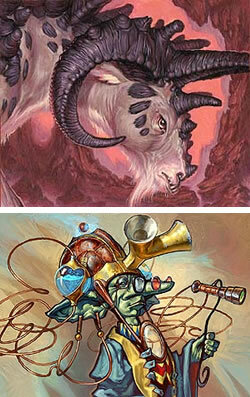 Some of Cavotta’s more imaginative images start to edge out past the traditional subject treatments for fantasy illustration into territory usually associated with fantastic or visionary gallery art, and the rendering of horns and scaly skin on his dragons and other fantasy animals make me think he would be interesting as a paleo artist. I know that that his work for Magic: The Gathering is meant to be reproduced at a relatively small size on the cards (list here), but some of his larger format work is for magazine covers, and all of it is so rich in detail that I think it’s really unfortunate that he hasn’t reproduced at least a few pieces on his site at a larger size. If you’ve been following lines and colors for the last month or so, you know I’ve been using the PBS broadcast on Monday nights of Simon Schama’s The Power of Art as a springboard for posts about related painters. Tonight’s show, however, is about Mark Rothko. Even though I occasionally like Rothko’s early Miro-like fantasies, and the later paintings of big, rough edged rectangles of color for which he is most known, I find it hard to generate any enthusiasm about him. I’m resisting the temptation to write an entire post expressing my dumbfounded amazement at his inclusion with the great painters and sculptors that have been the other subjects of Schama’s series; which I’ve likened to doing a special on Mozart, Bach, Beethoven and Brahams and tossing in Axl Rose. I’ve also mercifully decided against one of my acerbic rants about post-war modernism. Instead I thought “Why not write about a post-war modernist that I actually do like?” Though that’s a small group, the first one to pop into my mind was Claes Oldenburg, a post-war modernist whose work puts a genuine smile on my face, not simply one of bemusement. In the midst of a wave of modernist painters who took themselves way too seriously (e.g. Rothko), Oldenburg was a breath of fresh air. His giant renditions of ordinary objects are at once hilarious and thought-provoking. Oldenburg is primarily known for his large scale outdoor sculptures, usually of mundane objects that have been recreated at many times their original size and placed out of context not only by proportion and by being displayed in public spaces, but also by arrangement in unique and fun ways; like a sculpture of giant handlebars, partially visible so as to suggest a Buried Bicycle, a giant Dropped Bowl that has spilled 6-foot long apple slices and peels, or a half sunken bowling ball and an arrangement of 24 ft long Flying Pins. One of the best gifts an artist can bestow on the viewer is to make that miraculous connection in the brain that allows you to see the world, or some small part of it, with fresh eyes. Have you really looked at that pencil eraser on your desk? Have you noticed what that button on your dresser really looks like? Did you pay attention to the way your garden hose curled when you last walked by it? Art that takes things out of their ordinary context, from Marcel Duchamp’s signed urinal and upturned bicycle wheel in a stool, to the work of the pop artists of the sixties, with whom Oldenburg is loosely associated, utilizes the juxtaposition of ordinary objects with unusual settings, sizes or presentations to make us stop and shift our perceptions; and can often, particularly in the case of Oldenburg, be hilarious. Oldenburg’s smaller scale indoor works are frequently of commonplace objects that appear to be melting or soft. You can see some of his large scale works on the web site he shares with his wife and collaborator, sculptor Coosje van Bruggen, and some preliminary drawings and concepts on Ciudad de la pintura. The next year I had occasion to frequently walk down 15th Street in Philadelphia, near City Hall, and past Oldenburg’s Clothespin (also here and here), a stainless steel representation of the familiar object that is 45 feet high and has over the years acquired a patina of rust, making it even more interesting. 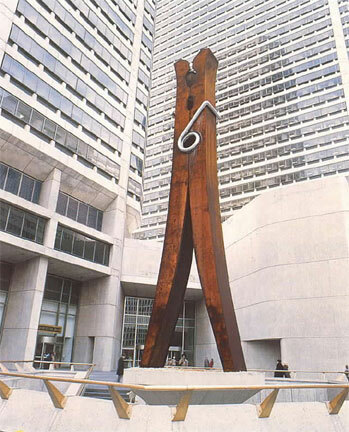 Anyone who lives or works in Center City Philadelphia knows it as simply “The Clothespin”, whether they’re aware of Oldenburg or not. Page lives in Maine, but apparently has some Philadelphia connection. In addition to being represented by a gallery here, a number of his paintings, particularly those in this show, are of Philadelphia scenes. 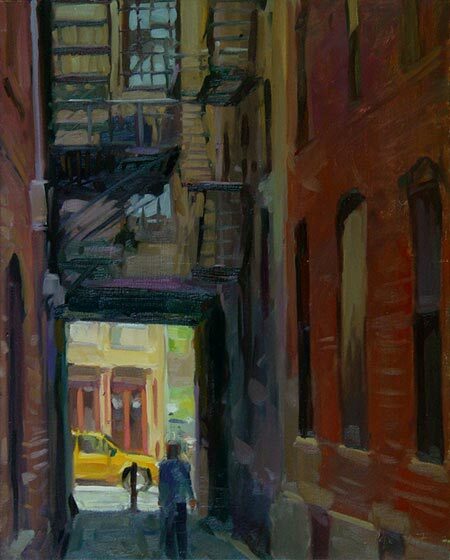 Though he occasionally paints landscapes, particularly of rocky coastal scenes in Maine, he more often paints cityscapes, townscapes and interiors, finding his compositions in the geometry of buildings and objects as well as in the negative spaces they define. Page has a great talent for simplifying his compositions to just the right degree to leave them strongly graphic but visually rich. He leaves the surfaces of his subjects briefly noted, instead letting the application of the areas of paint provide visual as well as physical texture. You’ll find a variety of his work on his own site and the three galleries listed below. When I wrote my post about “Golden Age” illustrator Willy Pogany in June, I was disappointed that I couldn’t find much in the way of online examples form his terrific drawing instruction book, The Art of Drawing. Well Stephen Worth and the good folks at the ASIFA-Hollywood Animation Archive, as part of their continuing campaign to make the web an even more wondrous and useful place, have dropped another gem on us. They’ve posted a 17 page taste of figure drawing instruction from Willy Pogany’s Drawing Lessons. 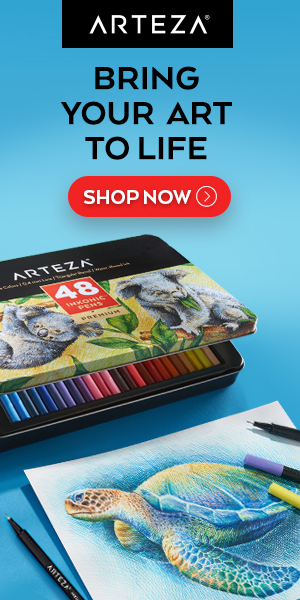 I’m a little unclear whether the currently available The Art of Drawing is a retitled version of Drawing Lessons, or if they simply share a lot of common material. Little matter, in that The Art of Drawing is easily available and is terrific. This is not so much a book on drawing the figure from life in a direct “draw what you see” way, as it is in the constructive tradition of teachers like Andrew Loomis and George Bridgeman, who teach how to construct the figure through an understanding of anatomy, perspective and the perception of the underlying solid geometry of living forms. As such, it belongs, along with books by Loomis, Bridgeman and Walt Reed, on the reference shelf of any artist who works with constructing figures from the imagination. In particular this means comic book artists and illustrators; though any artists who want a better feeling of solidity and three dimensional reality to their figures would benefit from the study of all of these instructors. The ASIFA excerpt from the book consists of 17 beautiful high-resoultion scans that are reproduced large enough (approximately 1200 x 1500) to get a real feeling for the solid draftsmanship and fresh, confident linework in Pogany’s drawings. The actual book is over 125 pages and remarkably inexpensive. Visionary artist Martina Hoffmann was born in Germany, grew up in Cameroon in West Africa, and now lives in Spain with her husband, artist Robert Venosa, who I profiled last week. She paints intricate, detailed works inspired by dreams and the unconscious, which makes it appropriate to call her work surreal, in spite of how picky I can be about the indiscriminate use of that term. Her pieces often involve themes of fertility, pregnancy, birth and other invocations of the universal feminine, as well as suggestions of altered stares of consciousness or spiritual awakening. She shares with Venosa a kinship to the liquid-reality visions of Surrealists Yves Tanguy, Max Ernst and Dali, and a fascination with the combination of imagined forms with traditional landscape elements. 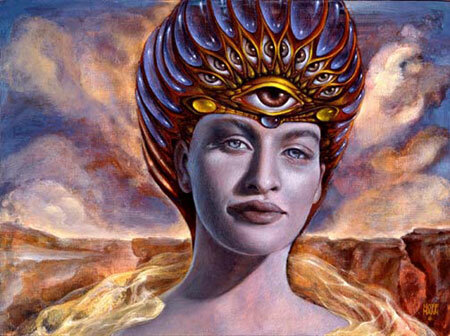 In her case there is also often an incorporation of intricate patterns, suggestive of radiant spiritual or biological energy, surrounding, or emanating from, living things, that brings to mind the work of Alex Grey. Hofffmann also has a fascinating series of portraits, in which there is a suggestion of other-worldliness or spitiruality to the backgrounds and settings. There is a gallery of her work on the beinArt Surreal Art Collective; and along with Venosa, she is one of the artists featured in their new collection Metamorphosis, which I wrote about in this post. There is also a gallery of her work on the Society for the Art of Imagination, along with a bio and interview. Addendum: I received a notice that Martina Hoffmann and Robert Venosa are conducting a series of workshops on Visionary Painting, the latest of which will be held this November 24th to 30th in Boulder, Colorado. 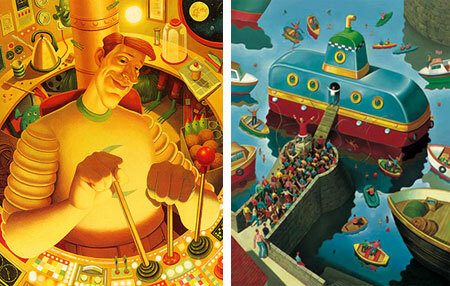 Though he does other advertising and editorial illustration, U.K. illustrator Simon Bartram is noted for a series of children’s books that he both wrote and illustrated: Watch out for Sprouts, Dougal’s Deep Sea Diary (image above, right) and Man on the Moon (a day in the life of Bob) (above, left). He has also illustrated children’s books for other authors, including Pumpkin Moon by Tim Preston, A Christmas Wish by Marcus Sedgwick and Night and the Candlemaker by Wolfgang Somary. Bartram’s children’s book illustrations often have characters with smallish heads and overlarge hands, and are painted with a kind of textured solidity that gives the exaggerated images a sort of nice, cheery goofiness. That, combined with backgrounds and scenes loaded with lots of objects and colorful details, provides a rich smorgasbord of shapes, colors and textures to satisfy the visual appetites of kids and adults alike. It’s easy to overlook the fact that illustrations for children’s books aimed at younger kids must appeal to both the kids and the adults, who need to remain amused themselves through repeated readings. Though Bartram doesn’t appear to have a web site, he has a portfolio on the site of his rep, ArenaWorks and another on the SAA Illustration Hub.